Heavy rains and storms continued to rake the Magnolia State into the night, moving into Alabama. In southeastern Alabama, a possible tornado has knocked out power and left damage in Troy, where a mobile home community was damaged, about 50 miles south of Montgomery. A tornado was reported in the area 140 miles southwest of Memphis, Tennessee, at the time. At least one mobile home was destroyed, throwing a man from the home. No fatalities were reported. Multiple people were apparently injured and several homes were damaged in Hamilton, Mississippi. In Starkville, Mississippi State University's 21,000 students huddled in basements and hallways as a tornado came near the school's campus. Trees were down and at least some minor structural damage was reported near the campus. 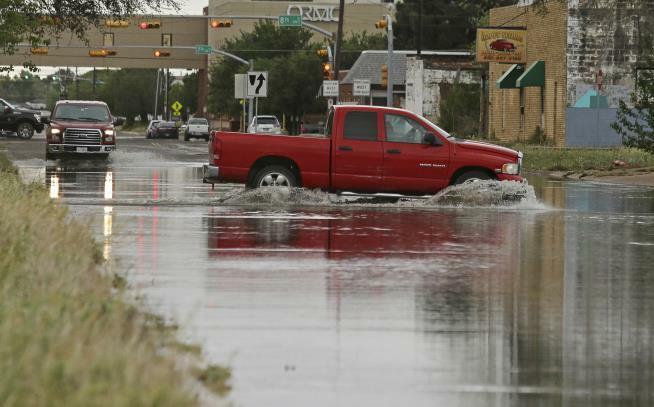 The large storm system also knocked out power to thousands and caused some flash flooding. The weather service said the system is expected to shift to the Ohio Valley and the Southeast on Sunday. More than 140,000 customers remained without power in Texas, Mississippi, Louisiana, and Arkansas late Saturday. A tornado hit the small Central Texas city of Franklin, overturning mobile homes and damaging other residences. Two people were hospitalized for injuries not thought to be life-threatening, while others were treated at the scene for minor injuries. The 83rd Masters Tournament in Augusta, Georgia, teed off earlier than expected in an effort to finish before storms roll in, the Atlanta Journal-Constitution reports. Leaders should be able to finish their rounds by 2:30pm; storms are expected around 3pm, per the Golf Channel. devastating. and those parents in the front seat..... no words can compensate or compare. I had a bad day yesterday. Everything I did went wrong. Now, after reading this I realize I had a really good day yesterday and I am so thankful for it. I can't imagine the pain and suffering all these people endured.